Hot-coating (aka fill-coating), is the second layer of resin applied to the board that fills in and smoothes out all of the bumps from the saturated weave of the fiberglass. The two terms are used somewhat interchangeably probably based on the timing of the coat. If you properly time your second coat you can apply this coat while the resin is still curing (hot) and avoid the need to abrade the surface with scratches, as the coats will chemically bond to each other. If you miss the chance to have a chemical bond you must wait for the lamination to cure so you can abrade the lamination coat with scratches allowing for a mechanical bond. Scuffing the dried lamination with a Scotch-Brite pad creates enough scratches for a good mechanical bond and you should not use sandpaper on the lamination coat as there is very little epoxy protecting the fiberglass cloth and sanding potentially open the sealed glass fibers and the weave will be visible in the finished board. 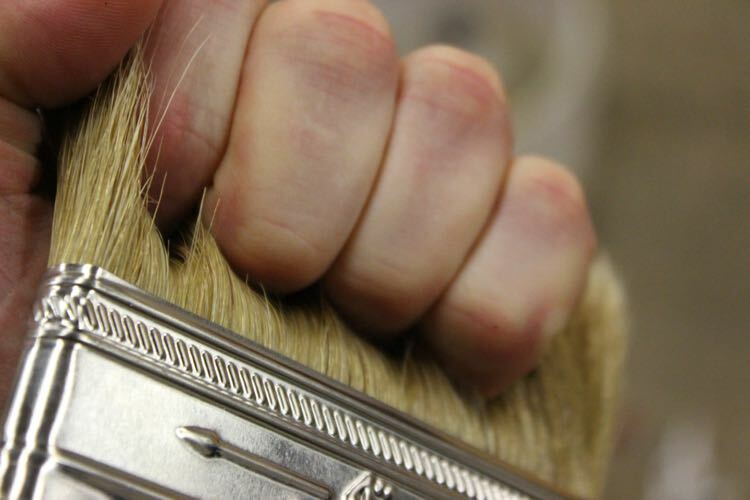 Timing is the key to doing a proper hot coat. The trick is timing the second coat while the epoxy has hardened enough that it is stable and will not absorb more epoxy and float the lamination but not too hard that it will not chemically bond. It would be nice if I could say, “Hot Coat 90 minutes after your Lamination Coat.” but variables like: room temperature, the speed of the hardener, how long the epoxy stayed in the mixing cup and how thick the epoxy lamination is are all factors that affect the time. The easiest thing is to simply check every so often and see if the resin is sticky. You want the laminate to feel dry on the surface but soft enough that you can still leave a mark with your fingernail. Always do these checks in the area below your tapeline, as it will be removed later. You do not want a bunch on fingernail marks in the finished area! Another easy test is to touch the curing epoxy with a cotton ball. If the epoxy holds feels dry but still holds on to the hairs on a cotton ball you are ready for your hot coat. 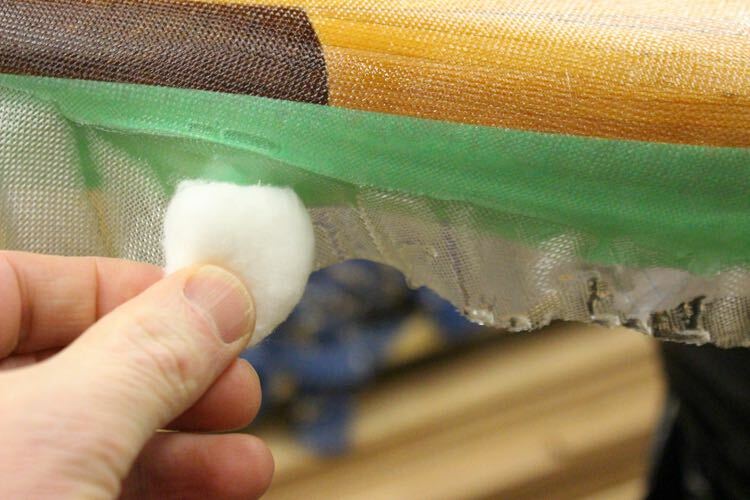 If the epoxy has dried to a point where it no longer grab any hairs from the cotton ball you have missed your opportunity and should let the resin cure so you can scuff the board with a Scotch-Brite pad and ensure that you will have a mechanical bond. I would recommend first checking about 75 minutes after you finished that lamination coat and then every 15 minutes until you reach the desired hardness level. You have about a 30-45 minute window of opportunity so the timing doesn’t have to be exact as long as you have everything ready when it is time. Once the board has been laminated it is time to get everything prepared for the hot coat. Most people hot-coat with a disposable 4” chip brush as cleaning a decent brush costs more and is more effort than it is worth. You can also use a 4″ foam brush with epoxy but I haven’t used one myself. Before you mix your resin, you should vigorously work your nails through the bristles of the chip brush, as they seem to shed more than quality brushes. After removing as many bristles as possible with your nails you should flex the brush back and forth into some tape to further pull any loose bristle out of the brush. I usually wrap the tape around one hand and work the brush with the other but I needed a free hand to take the picture. These precautions are worth the effort as it is much easier to deal with loose bristle before they are in the resin. As you are doing the actual hot coat keep you eyes on the brush as you can usually see the bristles that have come loose before they are in the resin. If you do see a bristle during the brushing they are fairly easy to recover by using the brush like a pitchfork to lift the bristle out of the resin. Once removed you can lightly re brush the affected area. If you find bristles after you have finished your final stroke using tweezers seem to be the easiest method to recover them. If the resin doesn’t repair itself it is recommend adding an extra drop of resin to the area as it is easer to sand a pimple flat than it is to fill a crater. While you are waiting for lamination coat to cure you can spend some of the time making sure everything is ready. 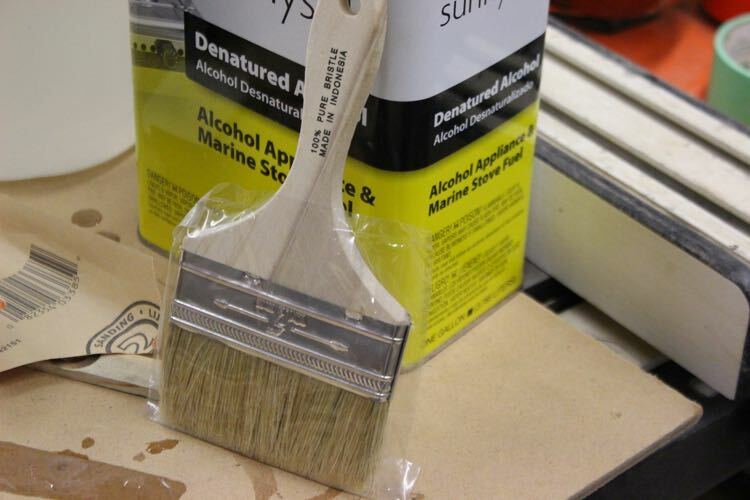 Once your board is ready and your brush is plucked, it’s time to mix your Epoxy. First step is to put on a clean pair of gloves. Since you are not putting any more fiberglass on the board, and the goal is to apply a thin, flat coat of resin, you will use significantly less epoxy for your hot-coat than you do in the lamination stage. The rule of thumb for hot coating a surfboard resin is a little more than 1 oz of part “A” per foot of board length. You will require a bit more than this for a paddleboard, as they are much wider. For a 10-foot board, start by mixing mix 8oz epoxy with 4oz of hardener, for a total of 12 oz of mixed material. It is advisable to split your required amount if you are new to glassing as the sooner you can get the resin out of the cup the longer you will have before the resin hardens. The 10-foot board that I am glassing in the tutorial will require between 15-18oz of epoxy. The cup is set to mix two-thirds of the estimated amount and the remainder will be easier to guesstimate when this batch is on the board. The second batch can be mixed in the same cup so there should be less wasted epoxy this way. Mix the resin slowly but thoroughly for 1-2 minutes with a clean mixing stick before applying it to the board, taking care to scrape the bottom and sides of the mixing bucket ensuring that that are no inclusions that are not thoroughly mixed. Note: If you are using Resin Research epoxy it is recommended that you use 2 caps full of Additive F for the hot-coat mix. 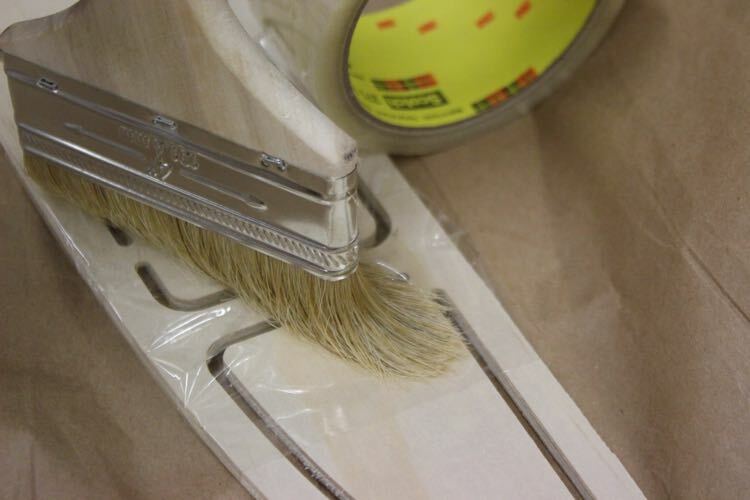 Additive F helps the epoxy flow evenly on the surface, and makes your final sanding job easier. With SliverTip epoxy this solvent/wax additive is not required. The key to a good hot-coat is to quickly get the epoxy evenly spread out and then to leave it alone. You have a relatively short window for the epoxy to self-level on the board. Watch the videos in this section for the technique but try to break the board into smaller areas than the videos show. The videos show a professional glassing a short board. Paddleboards can be glassed the same way but most of us do not do this like this everyday. Start with one-quarter of the side and then move to the next quarter. 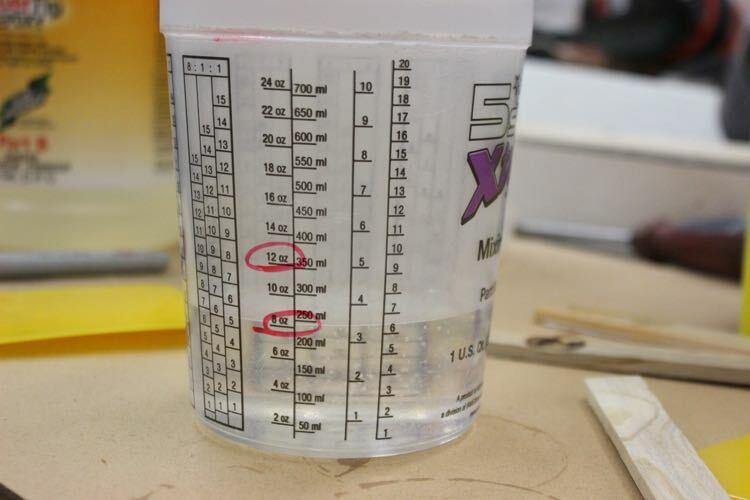 If you push the epoxy around for too long, it will not have enough time to self-level. The result is a coat with brush strokes and bumps that you will have to level by sanding later. To started pour about half of the required resin for the section down the centre of the board, and then pour the other half a few inches in from the perimeter of the rails. Immediately take your brush and plow the resin down the stringer line with medium pressure, leaving a thin coat of resin in its wake. Work your way nose-to tail in on either side of the stringer with your brush angled toward the rail. Try to stay in the section that you are working, as you will connect all the sections next. You should be pushing a pile of resin in front of the brush, and leaving a thin, smooth layer behind the brush. Keep working nose to tail outward, until you reach the tapeline on the rails. Repeat the step above in the next section until all 4 sections are complete. You will most likely need to stop to mix the a second batch of epoxy but you actually have more time splitting the batch like this then having a bunch of epoxy sitting in the mixing cup if you are novice. If you have a helper available they can mix the second batch of epoxy while you level the first batch. If you are using slow hardener you should have lots of time to do this step your self. The disadvantage of using a slow hardener is the epoxy will be open for longer giving bugs & dust a longer window to land on the curing epoxy. Your next step is to do light/medium pressure strokes from side to side across the board, from rail to rail. These strokes are sometimes done on a 45-degree angle but the goal is to make sure the resin is evenly spread. Try to address any thin spots or dry spots by adding more resin from the cup if needed. Try to catch the drips from the rails in your mixing cup, as you may need the resin for touch ups. Once you are done with the cross-strokes you finish by doing one final nose-tail pass, with lighter pressure, starting at the center and working your way toward the rails. When these strokes are complete the board should be looking great but double-check all around the deck and rails to make sure you didn’t miss any spots. The hot-coated area should have a shiny, wet, flat surface. Check for any brush bristles or other contaminants and use tweezers or the edge of your wet brush to retrieve them. Lightly brush over the area that you messed up removing the bristle. If you have any areas on the board where the epoxy is pulling away from or doesn’t want to stick, this usually means you have oil from your hands there. You can rub the problem area with your gloved finger to dissipate the oil, and then lightly brush the area with your brush. It is best to not touch the board with your bare hands between coats and just avoid this problem all together. The final area to double check is the rail area. Make sure there are no drips forming on the rails and the weave is full with resin. Stroke the bottom half of the rails lightly with one light pass all the way around the board as drips in this area are hard to see. The entire hot-coat process should take 10-15 minutes and the hardest part is turning the lights out and WALKING AWAY. It is temping to try to fix every blemish but epoxy only self levels for a short amount of time and you usually do more damage than good. If you see a crater you can add a drip with your mixing stick creating a pimple but most blemishes are easier to fix after the hot coat has cured if they don’t fix themselves after you turn out the lights. Florescent lights actually create dust so if you can turn them out!